Rather than spending time creating charts in a spreadsheet, your time can be better spent reviewing charts of energy load profiles and trends, building an understanding of how energy is used, and identifying and evaluating energy efficiency opportunities. Yearly chart (actually up to 2 years), showing average daily consumption each month, and year-to-date average. This chart is great for seeing seasonal patterns, and the year-to-date (YTD) trend line makes it each to tracking progress in reducing energy use. Monthly chart, showing average consumption each day. 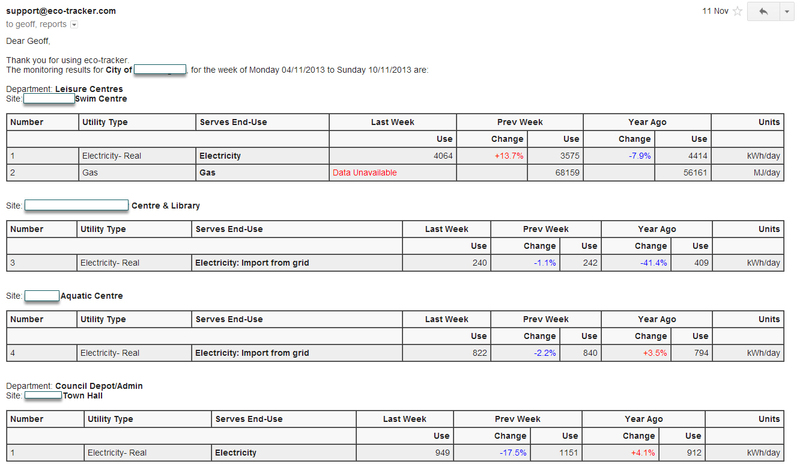 This chart is particularly good at highlighting the magnitude of energy use on weekends compared with weekdays. Like all eco-tracker charts, there are convenient buttons for navigating forward or back one day or one month, or jumping up a level to the year view. The table under the chart shows the total energy use each day. The chart and / or the table under the chart can be copied to the clipboard. 1-Day chart, shows the average consumption, each hour, from mid-night to midnight, for one day. This chart makes it easy to visualise consumption patterns. 1-Day chart (and ambient temperature), this is the same as the preceding chart type, with the ‘view temperature’ option box checked. This option will automatically display the ambient temperature each hour, for the closest Australian bureau of meteorology automatic weather station. This chart hows the average consumption, each hour, from mid-night to midnight, for one day. With this chart, you can quickly get an idea whether it was reasonable for the heating or cooling to be operating. 7-Day chart, this is chart we use the most. It quickly conveys the pattern of electricity, gas, etc. consumption over a week, and highlights issues such as base-load, after-hours consumption, anomalies in start-up and shut-down procedures. The above charts show just the main features. The eco-tracker user interface provides easy access to a wide range of viewing options, comparisons between meters, between charts, and the ability to jump back and forward in time. Having all these great charts available for analysing electricity, gas and water consumption patterns won’t help to reduce costs, if nobody looks at them. And it would easy to forget to look at them each week, because you are so busy. So we provide the option of an automatic weekly email (to whoever you chose, and as many people as you want). This allows the Environmental Manager, Energy Manager, Factory Manager, etc. to quickly see if consumption is tracking according to plan. The email reports on the average daily consumption for each meter (including virtual meters) for the week just finished, and compares this figure with the preceding week, and with the corresponding week one year earlier. For convenience, increased consumption is highlighted in red, and reduced consumption is highlighted in blue. Are you interested in getting in touch to discuss your energy and savings goals? Give us your contact details and we'll be in touch to help you take the next step.